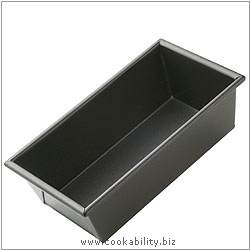 These loaf pans have straight corners where the metal is folded unlike some pans that are more curved where the metal is pressed into shape. These tins are great for bread, meatloaf and pate. 5 year guarantee on the non-stick. These pans are 3" deep.